Steel case and plastic drawer with smooth ball-bearing slides and spring lock. Organises valuable workspace to store keyboards under monitors and keeps work surfaces neat. Monitor is raised for better posture. Drawer extends out to 260mm, locking into position when in use. Dimensions: 552 (W) x 360 (D) x 90 (H) mm. 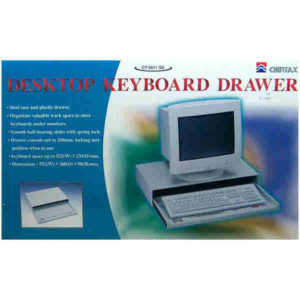 Keyboard space up to 525 (W) x 233 (D) mm.